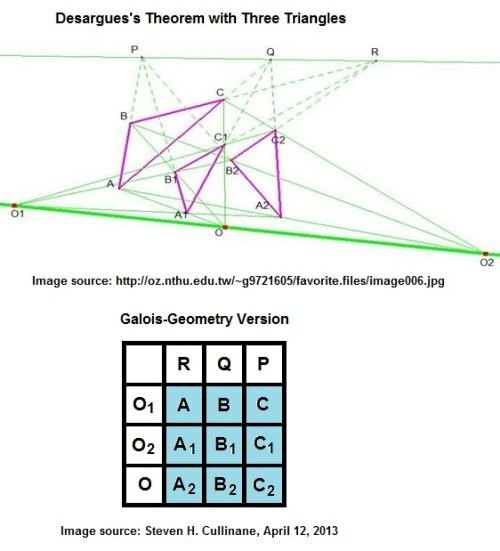 This is what I called "the large Desargues configuration"
in posts of April 2013 and later. they are perspective from a line." they are perspective from a point." if and only if they are in perspective centrally [i.e., from a point]." with 3 points on each line and 3 lines on each point. and 4 lines on each point. 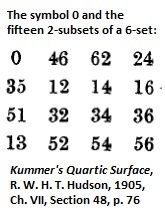 R. W. H. T. Hudson in Kummer's Quartic Surface ). "Jon Underwood, Founder of Death Cafe Movement,"
died suddenly at 44 on June 27. 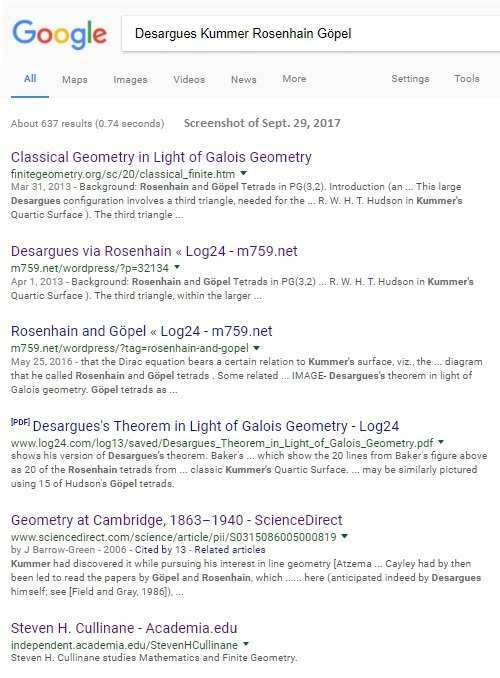 This journal on that date linked to a post titled "The Mystic Hexastigm." "Cézanne ignores the laws of classical perspective . . . ."
*The Hudson of the title is the author of Kummer's Quartic Surface (1905). the title, see Roger Fry in the previous post. 15 points and 20 lines instead of 10 points and 10 lines as above. 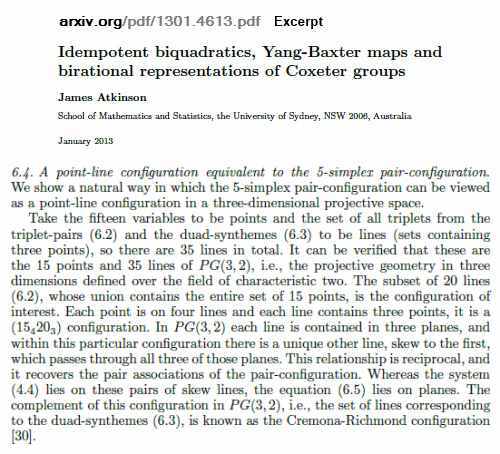 the small-configuration model's striking symmetry? poem by Marsha de la O titled "A Natural History of Light." 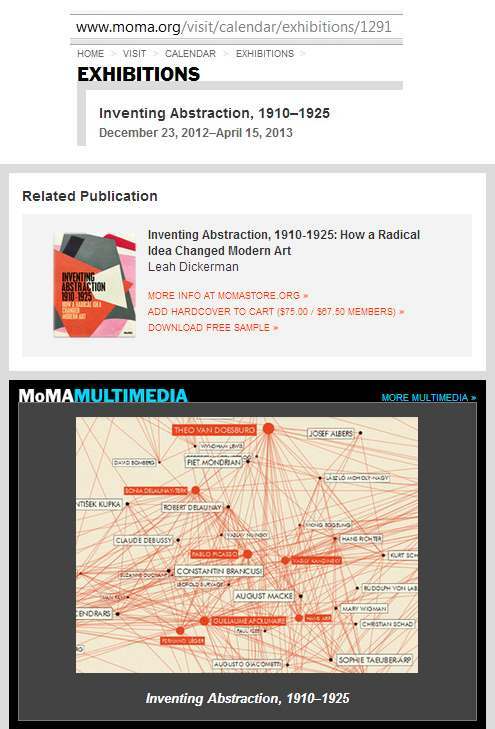 The thesis reportedly won an Art Directors Club award on April 5, 2013. 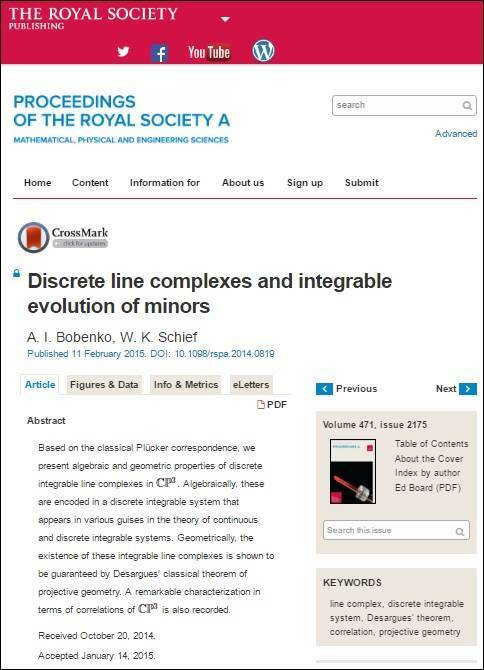 See a search for "large Desargues configuration" in this journal. 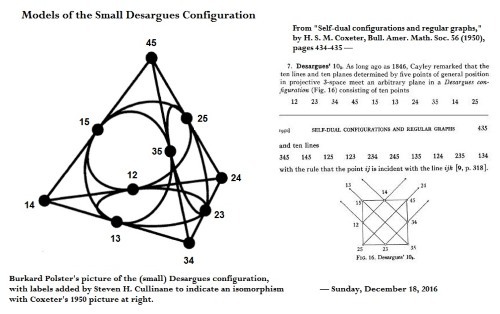 The 6 Jan. 2015 preprint "Danzer's Configuration Revisited,"
interesting context of Pascal's Hexagrammum Mysticum . dual to something they call the Steiner-Plücker configuration . of Boben et. al. , indicate how this works. 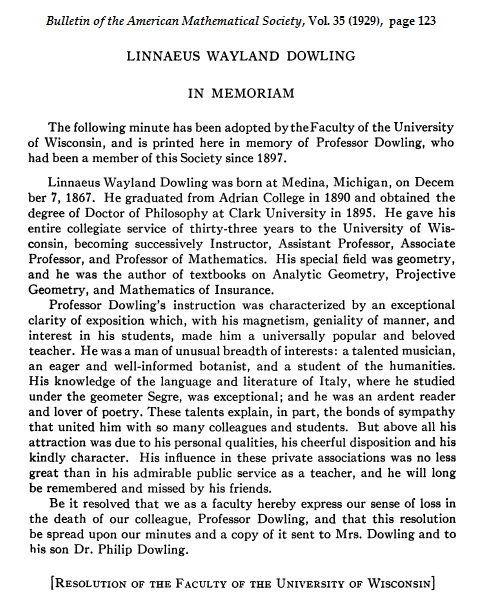 The duality was, as they note, previously described in 1898. 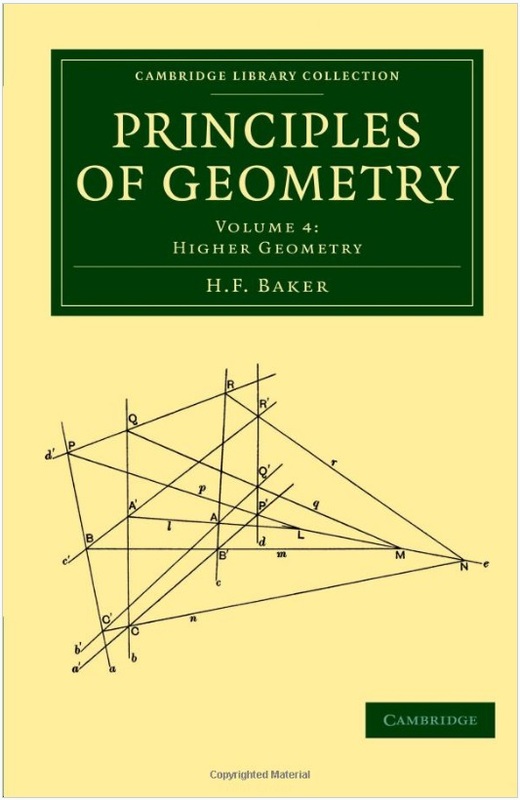 Baker, H. F., "Note II: On the Hexagrammum Mysticum of Pascal,"
Richmond, H. W., "The Figure Formed from Six Points in Space of Four Dimensions,"
Richmond, H. W., "On the Figure of Six Points in Space of Four Dimensions,"
What ‘purely aesthetic’ qualities can we distinguish in such theorems as Euclid’s or Pythagoras’s? I will not risk more than a few disjointed remarks. 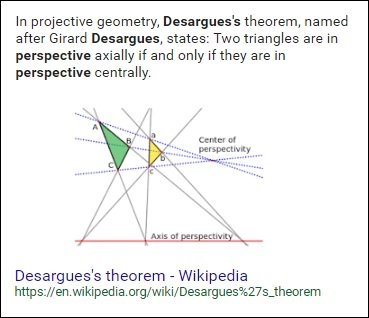 In both theorems (and in the theorems, of course, I include the proofs) there is a very high degree of unexpectedness, combined with inevitability and economy. The arguments take so odd and surprising a form; the weapons used seem so childishly simple when compared with the far-reaching results; but there is no escape from the conclusions. 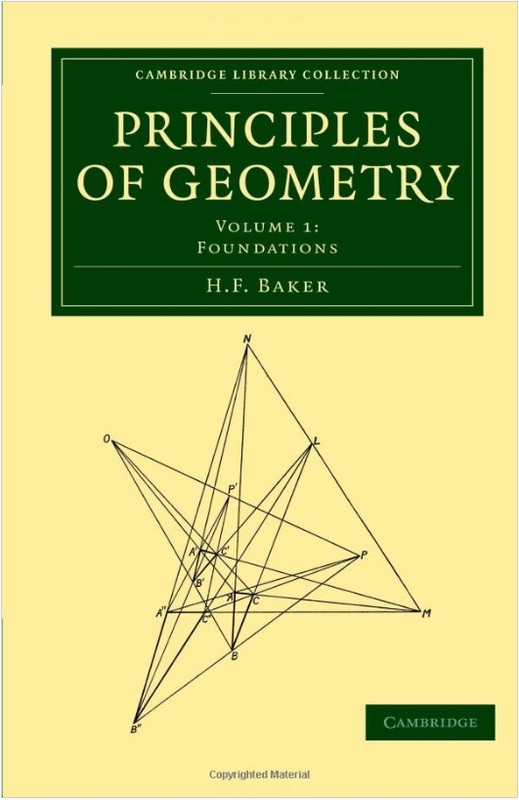 There are no complications of detail—one line of attack is enough in each case; and this is true too of the proofs of many much more difficult theorems, the full appreciation of which demands quite a high degree of technical proficiency. 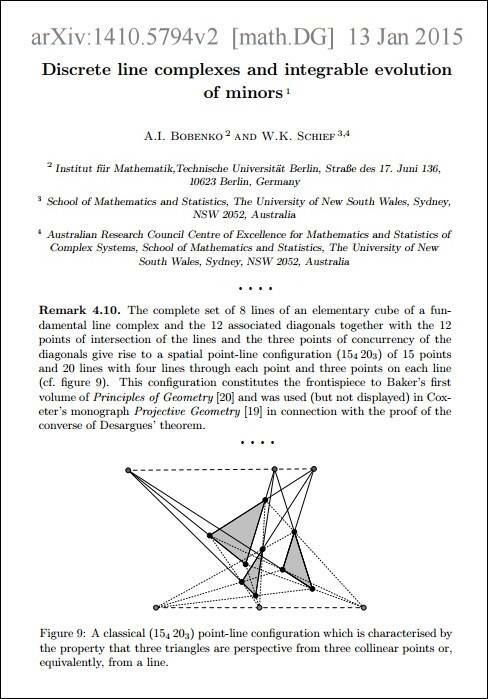 We do not want many ‘variations’ in the proof of a mathematical theorem: ‘enumeration of cases’, indeed, is one of the duller forms of mathematical argument. 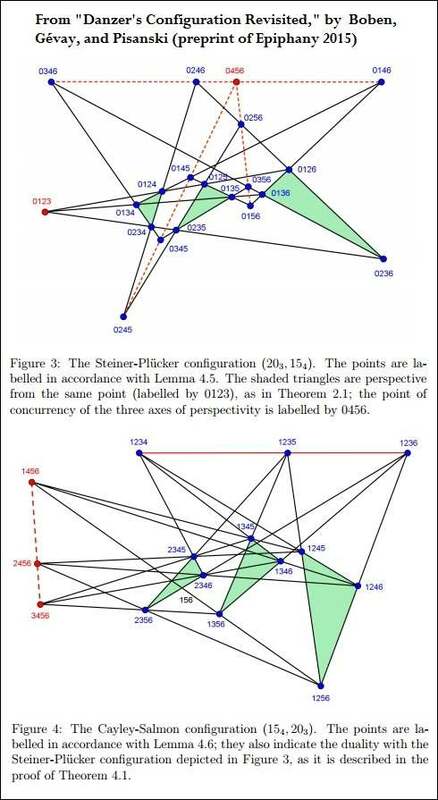 A mathematical proof should resemble a simple and clear-cut constellation, not a scattered cluster in the Milky Way. titled "Harvard Installs 'Triangle Constellation'"
"The Cardinal seemed a little preoccupied today." this journal for "April 19 ". Vide Classical Geometry in Light of Galois Geometry. I doubt they would play well together. string figures’ resemblance to figures of projective geometry. 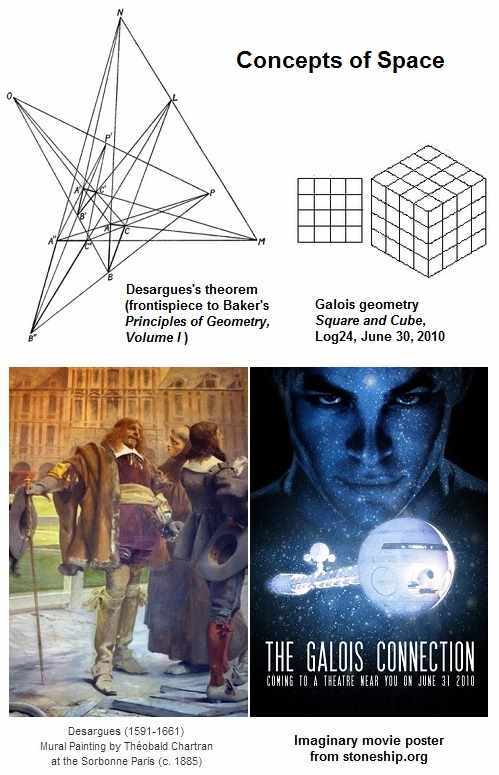 For further details, see posts on Desargues and Galois. may at times have twenty-first-century applications. 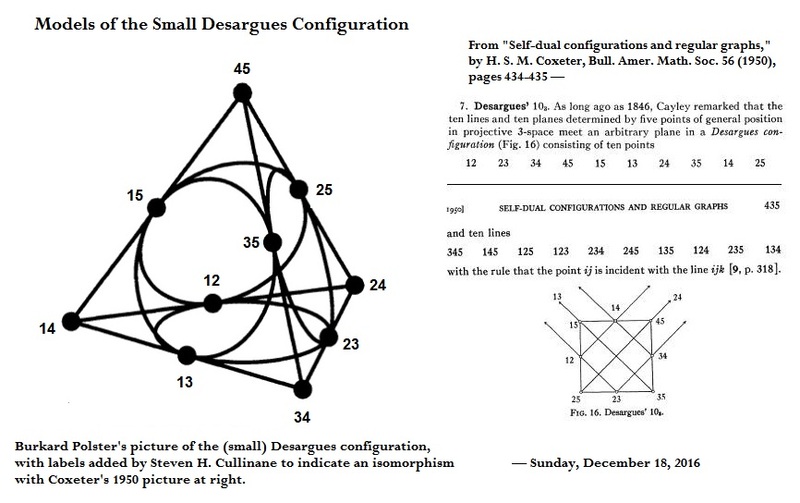 in 2013 provided a natural view of the large Desargues 154203 configuration. 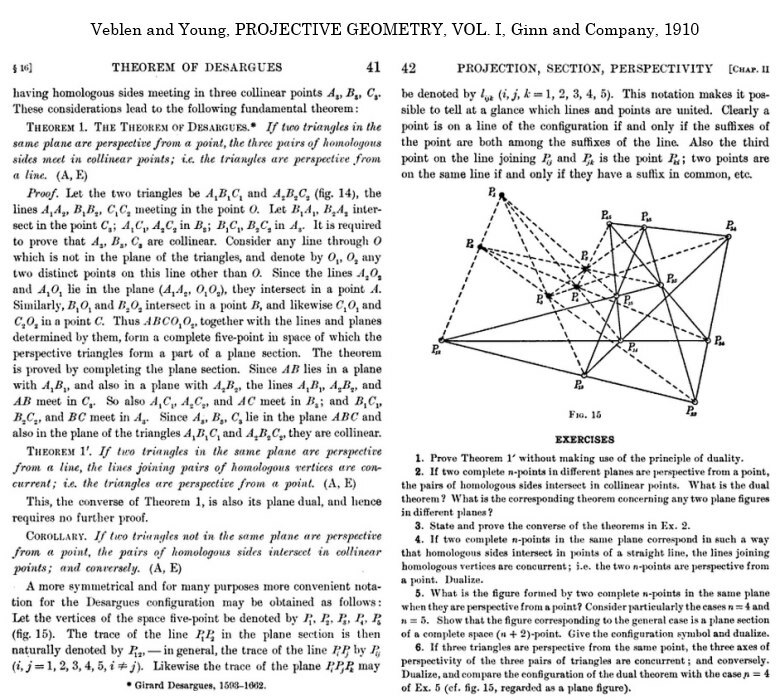 1905 classic Kummer's Quartic Surface. 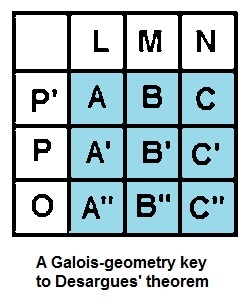 * E. Galois, definition of finite fields in "Sur la Théorie des Nombres,"
Vol. 13, 1830, pp. 428-435. 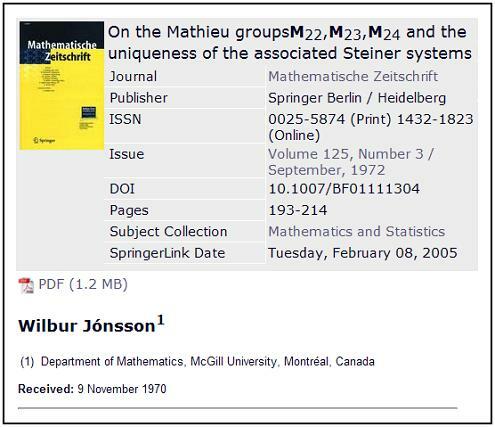 ** G. Fano, definition of PG(3,2) in "Sui Postulati Fondamentali…,"
Giornale di Matematiche, Vol. 30, 1892, pp. 106-132. 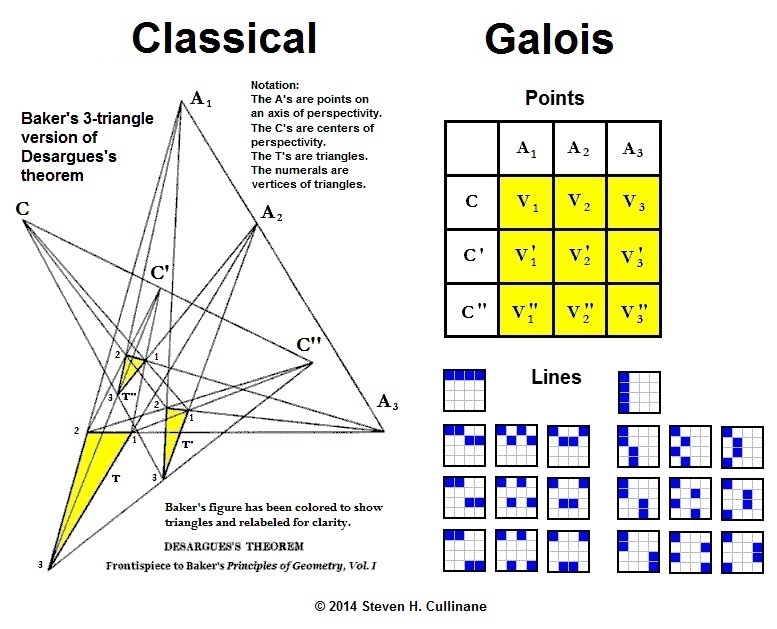 Classical Geometry in Light of Galois Geometry. Update of Aug. 7, 2013: See also an expanded PDF version. correspondence for what the thing, concept, or figure is ." 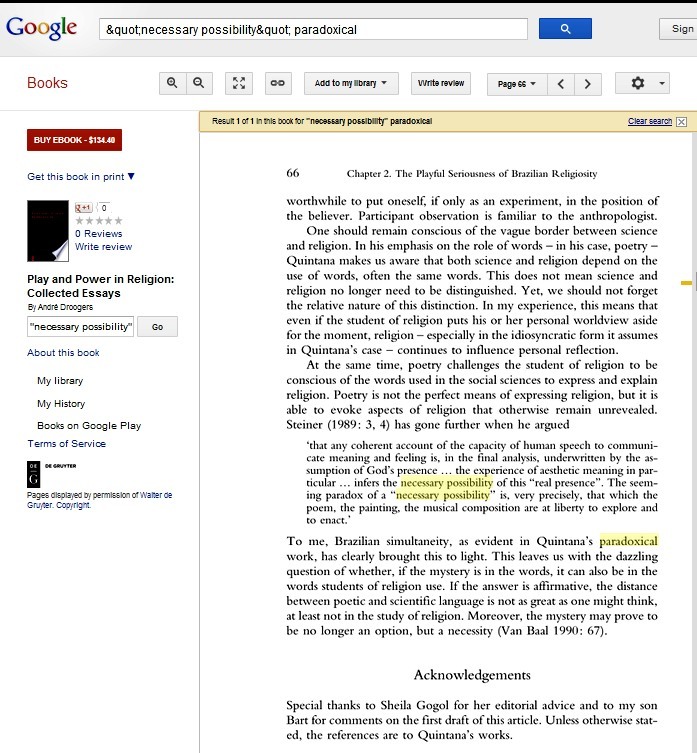 ​from the Meno on the facing page— her page 36 (right). 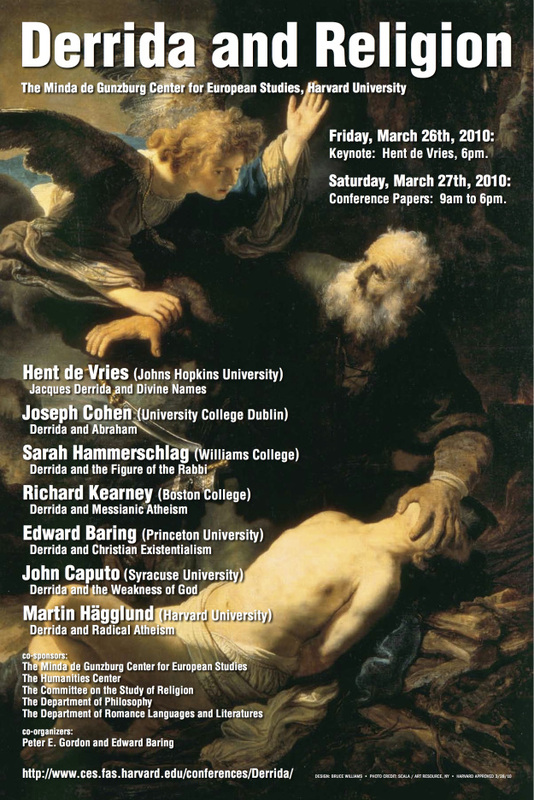 on Derrida and Religion . 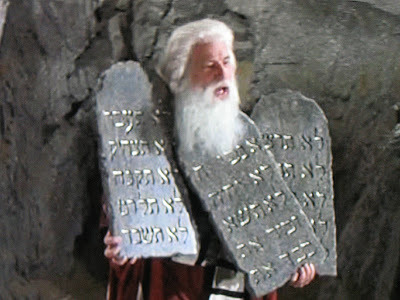 "The Poetics of the Broken Tablet." 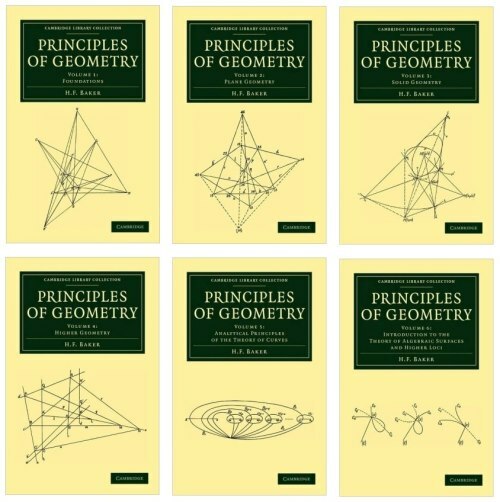 I prefer the poetics of projective geometry. configuration that is usually discussed. the context of Brazilian religion. "You Can't Make This Stuff Up." (15 points, 4 lines on each, and 20 lines, 3 points on each). (10 points, 3 lines on each, and 10 lines, 3 points on each). 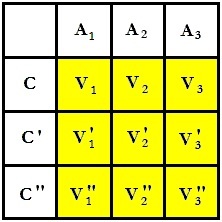 (6 points, 2 lines on each, and 4 lines, 3 points on each). (3 points, 1 line on each, and 1 line, 3 points on the line). (1 point and 0 lines). in the light of complete n-points in space. (Rewritten for clarity at about 10 AM ET April 29, with quote from Dowling added. 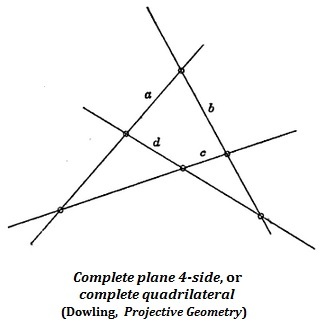 is obtained by taking the plane section of a complete space five-point." 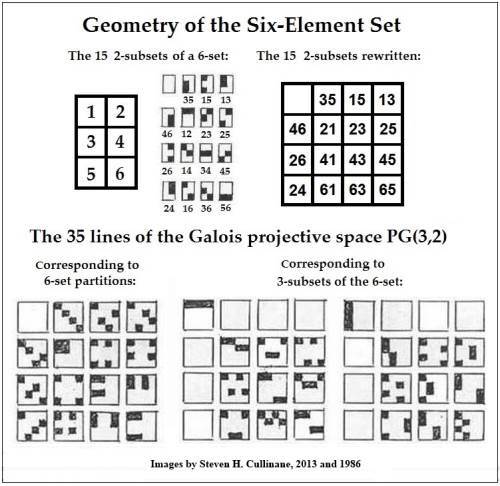 Each of figures 14 and 15 above has 15 points and 20 lines. 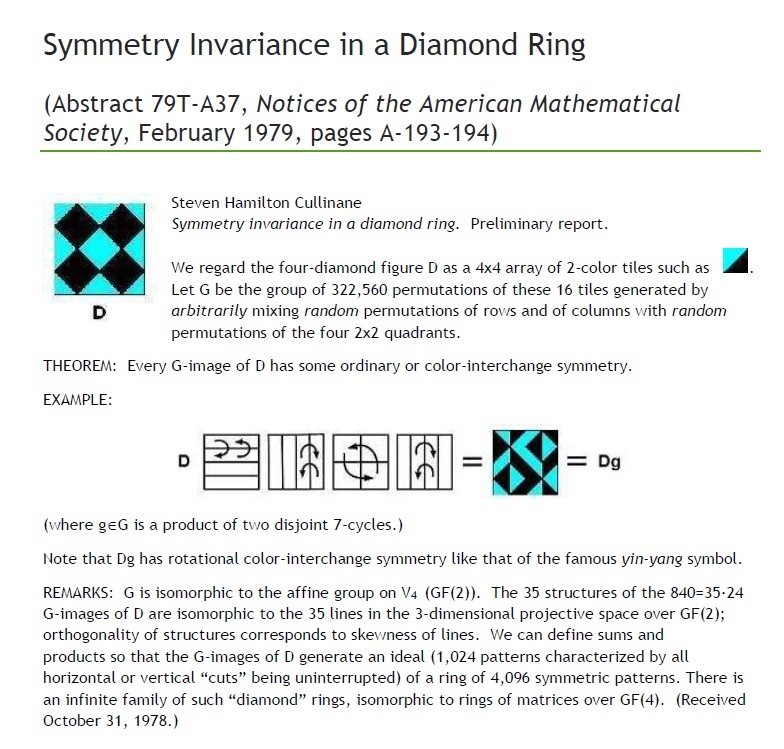 rather of Brianchon 's theorem and of the Pascal hexagram. 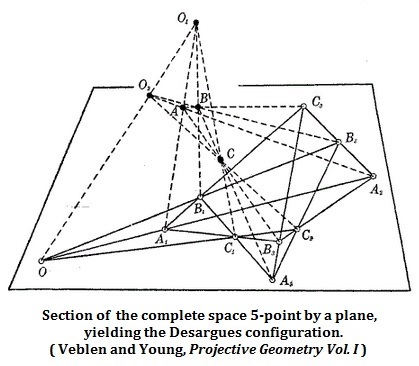 complete space five -point five years earlier by Veblen and Young. 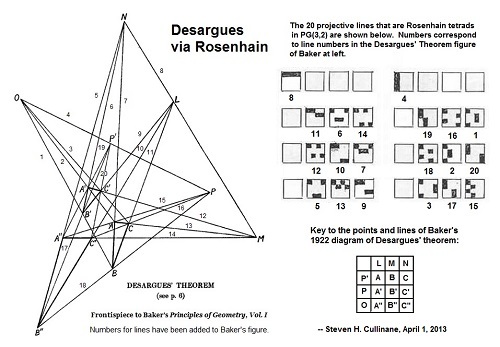 For this large Desargues configuration see April 19. For Henderson's complete six –point, see The Six-Set (April 23). See also Note on the MOG Correspondence from April 25, 2013. That correspondence was also discussed in a note 28 years ago, on this date in 1985.
film, perception and time — that detain him." "slow art," in this journal. 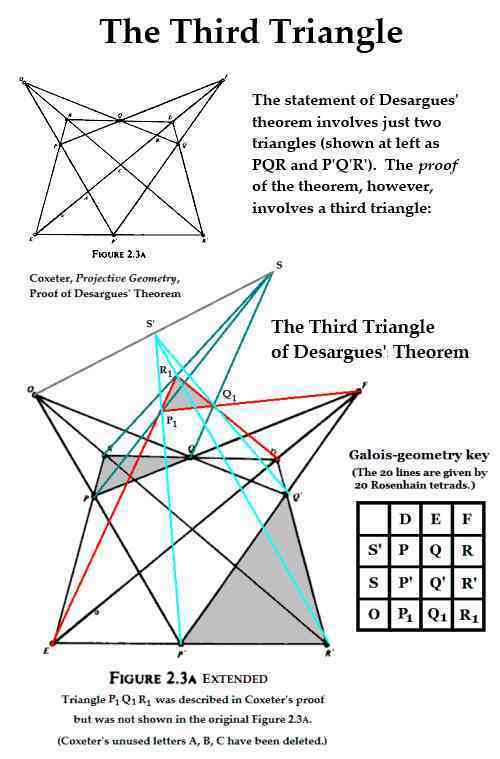 that shows a three-triangle version of Desargues's theorem. "We have had a gutful of fast art and fast food. authentic art can beat mass media at their own game." 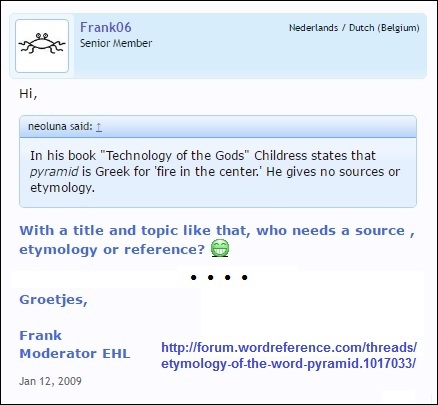 quoted here June 15, 2007.
we need a Museum of Slow Art. Those who prefer faster art may consult Ten Years After. 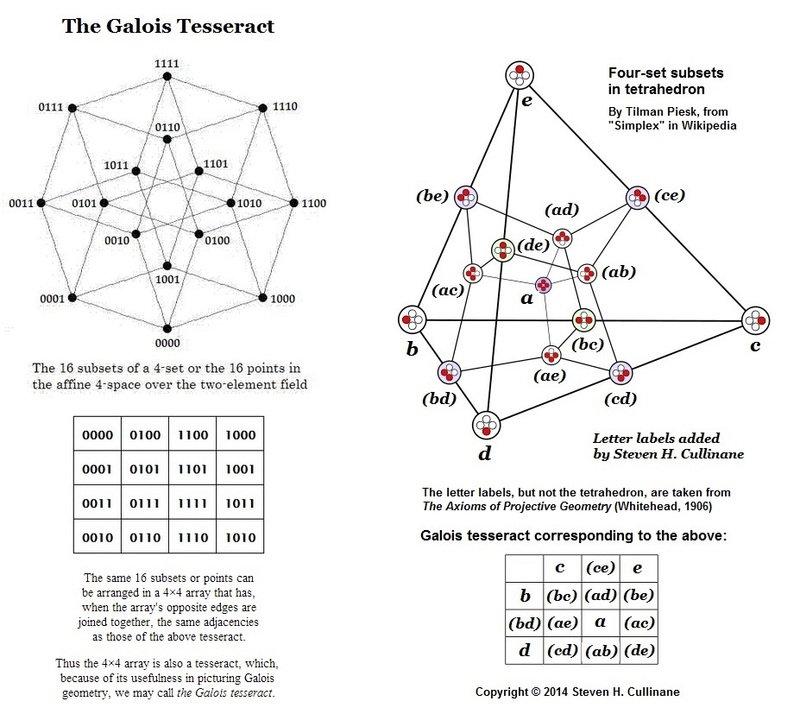 On the Hexagrammum Mysticum of Pascal. 4 lines on each, and 20 lines, 3 points on each). 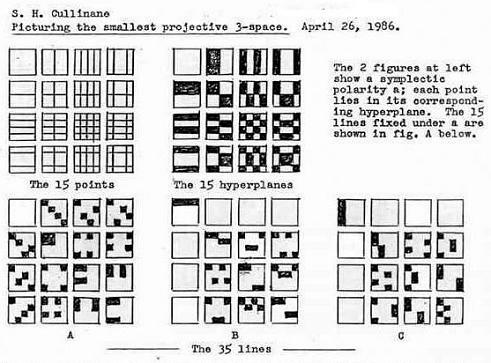 "The Complete Pascal Figure Graphically Presented,"
a webpage by J. Chris Fisher and Norma Fuller. 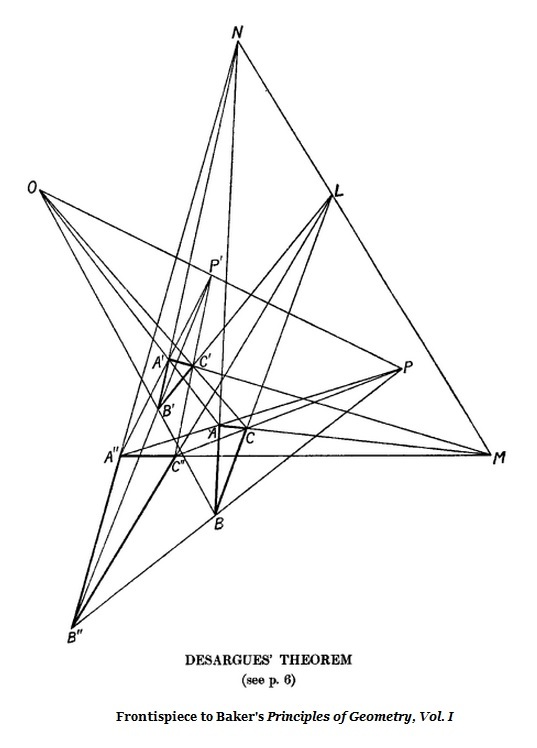 specifically, the diamond theorem square model of PG(3,2). "forming, in Cremona's phrase, the nocciolo of the whole." 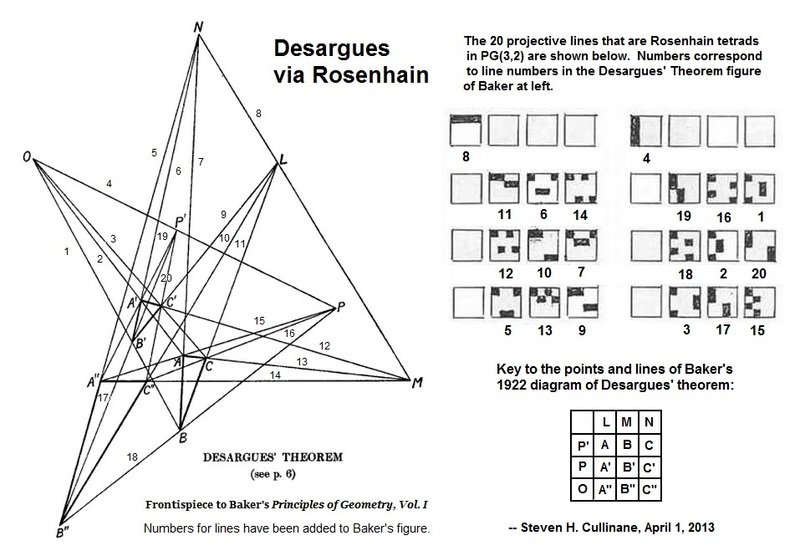 of the above picture of Baker's Desargues-theorem frontispiece. See also the original Veblen-Young figure in context. 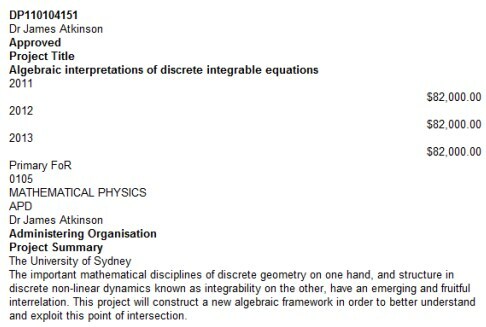 see the interplay in this journal between classical and finite geometry, i.e. 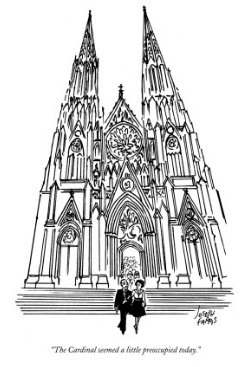 frontispiece, featuring the Göpel, rather than the Rosenhain, tetrads. 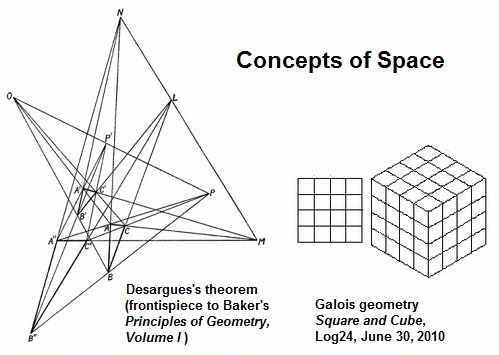 those names), see Picturing the Smallest Projective 3-Space.